Despite many Asbestos Management campaigns by the HSE, and the high profile it has within the construction industry, we are still seeing some very high fines in regard to Asbestos. Whether it is refurbishment or demolition the client has a duty to manage. 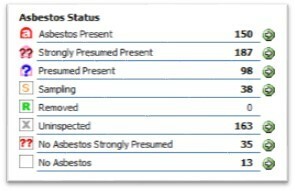 Where duty holders are falling fowl is in the production of up to date asbestos surveys so that construction can be carried out safely by contractors and their workers. Some of the fines are pretty hefty, and rightly so, we all know the effects of inhaling asbestos are long term - it is a killer! At Ai Solutions we offer peace of mind to Clients in the management of their building portfolio. With our ToolKit Compliance System we can provide you with an Asbestos portal that is available 24/7 and can be accessed by all interested parties. Provision of, and up to date, detailed register with all ACM's and subsequent risk ratings allows workers on site to view everything they need in regard to your buildings. On top of that you have the ability to schedule all your next surveys and monitor progress throughout the years. Contact us for a FREE consultation and demonstration of the ToolKit CS™ Asbestos product and let us show you how you can manage your Asbestos Portfolio simply and quickly. Call us on 01525 850080 or email info@aisolutions.co.uk for more information.